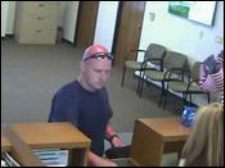 The robber walked into the bank, and passed a note to the teller claiming he had a gun. The clerk gave him some cash before the man escaped. However, no gun was actually displayed during the robbery. The robbery was captured on the bank’s surveillance cameras.